For most people, going to the car dealer is a chore right up there with unwanted dental surgery or a visit to the local DMV. It’s just a necessary but unpleasant task people have to endure. When it comes to big life decisions, 50% of people report researching and buying a car is more time consuming than deciding where to go to college and choosing a baby name, according to a recent survey commissioned by Capital One. In addition, 62% of car buyers are not fully confident they got a great deal the last time they bought a car. To add to that, 78% of Americans admit the last time they bought a car, they lost confidence that they would get the car they wanted during the shopping process. Capital One, the folks famous for asking “What’s in your wallet?”, thought there had to be a better way for everyone in this three-sided market of buyers, dealers and the bank. They applied a new Fast Data approach from Lightbend to reducing a task that would have taken 55 hours of computing time using legacy technologies to re-imagine the car-shopping experience with an architecture that produced results in under one second. And they made it available 24/7 on the Web at massive scale. Capital One’s Fred Crable, senior director of data engineering and augmented intelligence, asked his team why something as exciting as buying a new car needs to be fraught with this much anxiety? As the team dug deeper into the car-shopping process, they found that buyers are often left discouraged, realizing the payments are more than they expected because the total cost of ownership is larger than the price of the car. But oftentimes they don’t know this at the beginning of the shopping process, when they set their hearts on a particular car. Then what? Is it back to the drawing board? Do they start over, or settle for something outside of their budget? In 2015, Capital One introduced the first version of Auto Navigator, a cloud-based web application built on a micro-services architecture and powered by a suite of technologies, including machine learning. This Reactive Systems approach simplified the car shopping process for customers — allowing them to find, finance and fulfill their next car purchase with ease, convenience and confidence. Customers could browse nearly four million cars from over 12,000 participating dealers across the country. In the second iteration of the application, Crable and his team leveraged real-time data, which allowed them to determine how much customers would pay for any of the cars in their database for any of the combinations they choose (e.g., cash down, terms, etc.). More importantly, customers could now pre-qualify for financing with no impact to their credit score before ever stepping into a dealership. In under one second. Lightbend’s Fast Data platform delivered blazing results for Capital One. 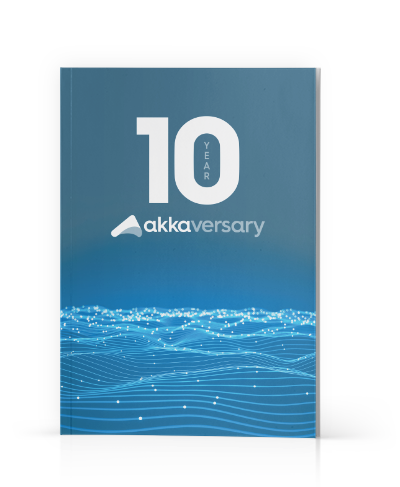 Driving the application was an architecture based on Akka and its actor model at the core with Apache Kafka for the messaging queue. Running Auto Navigator on a simple laptop they could support 486 applications a minute compared to at most 100 on a cluster of servers before, Crable said. Whereas the non-reactive old architecture could literally take more than two days to run an application as complex as the new Auto Navigator software system, with Lightbend and its Reactive Systems they were supporting up to 16 simultaneous users with 180 to 200 millisecond response times.